There is growing interest in Europe in editing non-native English for several reasons, one of which is the need for scientists and academics to publish in English. Related to this is the spread of English-language teaching and writing through universities (at universities in Scandinavia and in the Netherlands, for instance, science PhD theses are commonly written in English). In European business, as elsewhere in the world, English is dominant. And in the European Commission , which has 23 “official and working” languages and three “procedural” languages (English, French and German), English has become the dominant language used since the accession of ten former East Bloc countries, with the result that many documents are drafted in non-native English. These developments, reinforced by the spread of English via Internet, have led to a surge in non-native English text that needs to be edited to make it fit for purpose. In the Netherlands, academics, scientists and business people have been using English as their preferred international language for international communication since World War II. English is introduced early in Dutch schools (many of which now give bilingual education), and in Dutch universities, teaching is now largely in English. The Netherlands has therefore needed editors of non-native English for longer than countries such as Germany, France, Spain and Italy in which English-language communication has not been pursued for so long. It is therefore no surprise that the first society for editors of non-native English in Europe was founded in the Netherlands back in 1990 (SENSE: the Society of English-Native Speaking Editors in the Netherlands). Fifteen years later a similar society was set up in the Mediterranean area: MET (Mediterranean Editors and Translators). A Scandinavian society might follow in the next few years. These societies offer their members opportunities to acquire and refine the skills they need when working with English-language texts written by non-natives, and to exchange views about strategies and solutions needed to deal with specific problems encountered in assignments. They also actively and passively help their members (who live and work in non-Anglophone settings) to keep up with current English and to avoid language attrition. On the basis of my own long experience as an editor of non-native English (primarily – since 1976 – in the Netherlands), my involvement with SENSE (I am a founder member) and MET (as a member), and the insights gained from venturing into the field of applied linguistics for my PhD, I offer the following reflections on the skills and knowledge that an editor of non-native English should have. First, however, I will provide context for the discussion, by briefly mentioning the characteristics of non-native English, attempting to delineate the work domain of editors of non-native English, and discussing the people who become such editors whether by chance or by design. Knowledge of the main features of non-native English is useful in order to be able to edit such English. However, it is important to remember that the writing of non-native authors of English – especially if they are novice authors – is likely to have faults and inadequacies common to all draft texts, such as spelling errors, omissions, tautology and redundancy, which need to be amended by the editor. The specifically “non-native” characteristics of the writing can be grouped into two categories: language-learner features and linguistic and cultural transfers. Persons tasked with editing non-native English must therefore remedy not only the run-of-the mill textual problems but also the language-learner shortcomings (not only the errors missed by grammar- and spell-checking programs, but also features such as limited vocabulary and inappropriate register) and the transfers. Recognising transfers from an author’s mother tongue or writing culture (or both) is not straightforward. To be able to recognise direct transfers (for example, a Dutch author writing monster instead of sample), false friends and literal translations, it helps to be able to speak, or at least to be familiar with the author’s language: in other words, to be able to use translation strategies. 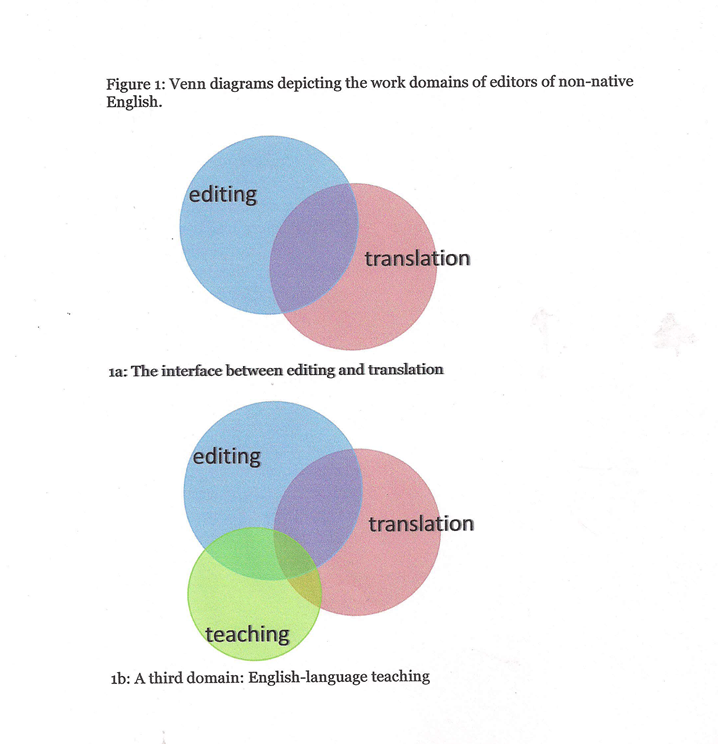 In view of the above, it is possible to visualise editors of non-native English as working at the interface of editing and translation, in the zone of overlap depicted in the Venn diagram shown in Figure 1a. They draw on knowledge and skills from at least these two domains and, when correcting language-learner errors, possibly also from a third: the teaching of English as a second language (Figure 1b). Teachers edit and correct their pupils’ writing as a matter of course, so it is no surprise to find that there is a link between editing and the teaching of writing (Burgess & Pallant 2013, Burrough-Boenisch 2013). Indeed, many members of SENSE and MET are teachers of English for Specific Purposes (academic, scientific or business English). Teachers of English form but one category of editors of non-native English. Other categories are professional editors, translators and native-English-speaker colleagues or acquaintances of the author. Of all these categories, it is the language professionals (teachers, editors, translators) who can be expected to be best able to recognise and deal with the textual shortcomings of non-native English, although it must not be forgotten that author colleagues or acquaintances who are subject experts can make insightful substantive improvements to a text (see, for example, Willey & Tanimoto 2012). It is worth emphasising that persons who solicit assignments to edit non-native English or are asked to do such editing do not necessarily have experience in the types of editing that professional editors are called on to do when working for publishers or other institutions that issue paper or electronic corporate publications. They may be freelance or agency translators who have been tasked to process translations or texts prepared by non-native speakers of English. They may be volunteers (graduate students or lecturers) from a university department’s student resource centre, working pro bono (Harwood et al. 2009, 2011. )They may be “convenience editors” (Willey & Tanimoto 2012): English native speakers working in a non-Anglophone country, whose non-native-speaker colleagues or acquaintances request to check through English manuscripts. The four such editors in Japan studied by Willey and Tanimoto happened to be English teachers who were given medical texts to check; in academic settings, such teachers (whether TEFL, EAP, ESL, or ESP) are particularly likely to be approached by NNS authors. But visiting scientists or academics not associated with university language or writing centres and with no training in English-language teaching may also be called upon to help NNS authors, as may the NS spouses or partners of NNS employees in an academic or commercial setting. Such services may be requested as a favour, or may be provided for a fee (token, or realistic and including local tax). In UK universities, it seems that the language correction services offered to students as “proofreading” are largely provided by academically trained and generally not commercially-oriented persons – at least the data Harwood et al. (2009) provide on the rates charged by their 16 informants engaged in “proofreading” student texts at Exeter University suggest that few of them are earning a living from this work. NNS students also benefit from English-language assistance provided incidentally by their lecturers and supervisors. In countries such as Sweden and the Netherlands, where much university education is given in English, the supervisors and lecturers may themselves be non-native speakers (for example, Prof. Bjorn Gustavii, author of a book on scientific English: Gustavii 2008). The non-native-speaker supervisor may have a very different linguistic background from his or her students (as is often the case in the Netherlands, for example, where Dutch academics often supervise PhD students from East Asia or Eastern Europe). Let us leave the non-native-English lecturers and supervisors aside, as – like journal reviewers – their main purpose when reading student writing is to assess its content, not to critically scrutinise the English with the aim of improving it appropriately. Though they may correct and improve the English, they do so in passing: they are not expected to do so rigorously and consistently. Let us also ignore the English-language teachers who read NNS writing critically – not to assess its content, but with the express aim of identifying errors and shortcomings and of teaching the English-learner author to rectify them. Their students may be at universities or colleges, or, if the teacher teaches business English, be employees in commercial settings. What remains after these two groups of teachers have been excluded are the “proofreaders” who service non-native-English students in UK universities, the “convenience editors” whose services are enlisted by non-native-English researchers, scientists or business people, and various in-house and freelance language processors. The in-house employees could be in university language centres, or in government ministries, or in national or international institutions, organisations or companies, and, like the freelancers, be working as translators (Mossop 2007; Wagner et al. 2001 p. 75), editors, authors’ editors (see Burrough-Boenisch & Matarese 2013) or copyeditors (de Jager 2013). Ideally, what skills and knowledge should they have in order to do their job? Clearly, editors of non-native English should know what editing entails and how to go about editing. However, as explained elsewhere (Burrough-Boenisch 2013a), the English word “editing” means different things to different people, depending on their mother tongue and their field of work. Different connotations are attached to editing and the terminology to describe text processing, even within the language professions (journalism, publishing, copywriting and translation, for example). This makes it important that editors of non-native English texts know the prevailing concepts and vocabulary used to describe their work, so they can avoid misunderstanding when talking about their editing with colleagues, clients and others. They should certainly be aware of the terminology used by the publishing industry, particularly the distinction between copyediting and substantive editing and the connotation of proofreading in that industry. They may decide not to master the mark-up techniques used by copyeditors to prepare electronic matter for publication, but they should be aware that regardless of whether the text is in native or non-native English, a basic requirement when editing professionally is consistency. They must therefore learn the discipline of adhering to self-imposed or prescribed style (for example, relating to spelling, or to the use of abbreviations, the formatting of references and the appropriate standards for international symbols for units of measurement) and know how and when to use style manuals. They should understand the concepts of levels of edit and how these relate to the continuum of editing that ranges from copyediting to developmental editing/ghostwriting (Burrough-Boenisch 2013a), as this will help them to situate their work conceptually. If in-house or vocational training in editing practices is not an option, the aspiring editor of non-native English can learn about the principles of editing from standard reference works such as Mackenzie (1999), Norton (2009), Sharpe and Gunther (1994) and – for technical editors – Alley (2009). The general principles of editorial interventions such as removing redundancy, ensuring accuracy, editing to achieve clarity of expression and logic of presentation are the same in all Anglophone settings. At the level of detail required when copyediting, however, there are differences between and within varieties of English, and the editor of non-native English may be faced with choices about whether to adopt British or American conventions. Editors of non-native texts who live and work in an Anglophone country will not be faced with a dilemma: they will follow the publishing and stylistic conventions prevailing in that country. So, for example, for UK-based editors the standard reference work on copyediting is Butcher et al. (2006); the equivalent for US-based editors is Einsohn (2011). But editors who live and work in non-Anglophone settings need to be aware of conventions and practices of both main forms of English: American and British, even though when given a choice, they will have a preference based on their native or acquired variant of English. The reason they need to know of the different conventions and stylistic preferences of the two main Englishes is so they can adjust their editing to the form of English a particular non-native-speaker author tends towards, having been trained in that type of English or having lived or worked in a particular Anglophone culture. (Note the “tends toward”: in practice, many non-native-speaker authors – at least, those in Europe – write in a mixture of British and American English that at the very least needs to have its spelling standardised to one of these Englishes.) Non-native-speaker authors themselves may need to switch from one form of English to another for their work. Scientists and academics, for example, may submit their research articles to American or British journals. Thus a particular author may write one research article for submission to the British Medical Journal and a following article for submission to the New England Journal of Medicine. The English of the submitted articles must not only follow the style requirements of the journal or publisher but must also match the journal’s variant of English, so the editor of non-native English must be prepared to edit to that English’s conventions. To do so, the editor should follow a style manual, which prescribes various aspects of language: spelling, punctuation, use of typefaces (italics, for example), capitalisation and so on. The standard manuals for copyediting texts are Ritter (2003 and 2005) in Britain and University of Chicago Press (2010) in America, but there are also style guides for journalists, editors of scholarly publications (for example, Modern Humanities Research Association 2013) and science editors (Council of Science Editors 2006). Some style manuals are prescriptive about contentious issues of grammar and usage, such as the admissibility of the split infinitive and the “correct” verb form (singular or plural) to use after “data”. But the English language continues to evolve apace, and usage changes, so authors and editors must be wary of rigidly adhering to prescriptive usage guides when there is reliable evidence that a particular usage is giving way to another. Editors of non-native English, particularly those living and working in non-Anglophone settings, should particularly beware of entrenching themselves in prescriptivism and should be receptive to the findings of descriptive grammarians, who record how language is actually being used. Peters (2004) is a valuable resource on current English usage, as it is based on research on corpora of American and British English and on comparisons of grammar and usage books on American, Australian, British and Canadian English. It thus gives a balanced international picture of the scope of the major Englishes. Editors specialising in American English might prefer Garner (2009), which also takes account of actual usage rather than perpetuating certain usages discredited by descriptive linguists. Editors of non-native English who edit texts on specialist subjects in which terminology is evolving rapidly, or with which the editor is not fully conversant can themselves use the techniques used in descriptive linguistics research to establish whether a word or phrase is admissible in that particular field (be it in science, humanities, law, or business). Searching the Internet to check terminology is time-consuming (as acknowledged by one “convenience editor”: see Willey 2013, p. 26) and, even when refined, the searches yield many duplicates and hits from unreliable sources. A better option is to consult publicly accessible corpora, such as the Corpus of Contemporary American English (to check current American usage), or, for scientific terminology and usage, Springer exemplar, which gives access to all books and journal articles published by Springer. An even better strategy for specialist editors is to build up their own corpora of reliable exemplary published texts and use these to establish the admissibility of terms and usages (see Burgess & Cargill 2013; Kerans 2006). By inputting very recent published texts from reputable sources (books, journals, or even websites) into the corpus, an editor can keep abreast of current usage in particular fields and selected text types (genres). Indeed, awareness of genre theory (see for example Swales 2004) enables editors to analyse and compare genres from the author’s culture with the equivalent genres in English. This will often reveal ways in which the non-native English text needs to be adjusted in order to meet the genre expectations prevalent in the Anglophone world. A good example of an intercultural genre difference is the verb tense convention in minutes of meetings: French and Dutch are among the languages in which the convention differs from that in English (they report in the present rather than the past tense). Intercultural genre comparisons have brought us into the domain of translation: professional translators routinely deal with such differences between the source language and the target language and have an intimate knowledge of both languages and cultures that they rely on. They will deploy this knowledge when editing non-native English and can be expected to be particularly alert for false friends and other linguistic and cultural transfers (de Jager 2013; see also Bennett 2013). Editors of non-native English who are not bilingual or bicultural, or who are unfamiliar with the author’s mother tongue – or both – have various ways of acquiring skills in identifying and rectifying these features of non-native English. Lists of false friends between English and various languages can be found on the Web (for example, http://quizlet.com/5861443/translation-hebrew-english-false-friends-flash-cards/). To acquire translator insights into grammatical differences that help them to recognise and remedy many transfers, editors specialising in particular types of non-native English can consult contrastive grammar books (my Internet searching revealed that among the combinations available are English/Arabic, English/Danish, English/Dutch, English/French and English/German). By comparing style guides in English with style guides in the author’s language, editors (and translators) will discover differences in conventions that are easily transferred into English: for example, in punctuation, alphabetisation and usage of Latin. Even monolingual English editors can learn to use translation tools to solve apparently nonsense English. The translation tools available on the Web can be used to back-translate “nonsense” sentences or phrases into the author’s language. The Internet translation tool will reveal alternative translations for a highlighted word, and this can lead the editor directly or indirectly (via a false friend) to the editorial solution (see Burrough-Boenisch in press). Editors of non-native English who have a background in teaching the writing of English know how to achieve effective English prose. Some of their skills are also described in the editing manuals mentioned earlier: they include removing redundancy, adjusting sentence length and linking consecutive sentences so that they form coherent prose. One important rhetorical device that is familiar to writing teachers and can be profitably deployed by editors of non-native English is to do with optimally ordering the information in sentences. Sometimes known as “theme – rheme” or “given – new”, this is a strategy whereby the new – important – information is put at the end of the sentence. This information – by now it has become “old” information – is then alluded to at the start of the next sentence, which in turn ends with new important information. And so on. It is this principle that explains why editors of non-native English so often find themselves improving the flow of a paragraph by turning sentences around (Norris 1998). This has been a very personal view of editing non-native English and it has inevitably been coloured by my own experience. I became an editor of non-native English through the circumstances in which I found myself. In Borneo (Sabah), purely on the basis of my English-native-speaker status and academic background (a newly acquired MA) I was asked to correct texts written by Malaysian agricultural scientists; in Australia I was employed as an editorial officer by the New South Wales Department of Agriculture (that’s where I was taught how to edit) and then, after I moved to the Netherlands I found my skills were in demand for editing Dutch-authored research papers. It was the editing of these papers and the questioning of why texts by intelligent Dutch writers consistently made certain errors and had certain idiosyncrasies that inspired me to try to explain the reasons for these features and patterns and to do research in applied linguistics. Along the way I had added Dutch to English translation to my language services, and so had become more aware of the scope for transfers between the two languages. I and those of my colleagues in SENSE and MET who started editing non-native English over 40 (!) years ago learned mostly by doing. Nowadays, there is a wealth of knowledge and information available on the Web that can be tapped by aspiring and practising editors of non-native English – on aspects of editing, translation, language learning, language interference, writing, and so on. In this contribution I have tried to provide a framework that can be used to put these resources into perspective. Perhaps it will also inspire some form of formal training in the editing of non-native English. I thank Mary Ellen Kerans for being a sounding board and for her thoughts on the skills needed by editors of non-native English. Alley M (2000) The Craft of Editing: A Guide for Managers, Scientists, and Engineers. New York: Springer-Verlag. Burgess S & Cargill M (2013) Using genre analysis and corpus linguistics to teach research article writing. In: Matarese V, editor. Supporting Research Writing: Roles and Challenges in Multilingual Settings. Oxford: Chandos, pp. 55-71. Burgess S & Pallant S (2013) Teaching academic writing in Europe: multilingual and multicultural contexts. In: Matarese V, editor. Supporting Research Writing: Roles and Challenges in Multilingual Settings. Oxford: Chandos, pp. 19-38. Burrough-Boenisch J (in press) Editing texts by non-native speakers of English. In: Smart P, Maisonneuve H & Polderman A, editors. Science Editors’ Handbook, European Association of Science Editors. Burrough-Boenisch J (2013a) Defining and describing editing. In: Matarese V, editor. Supporting Research Writing: Roles and Challenges in Multilingual Settings. Oxford: Chandos, pp. 173-189. Burrough-Boenisch J (2013b) Didactic editing: bringing novice writers into the arena of scholarly publishing. In: Matarese V, editor. Supporting Research Writing: Roles and Challenges in Multilingual Settings. Oxford: Chandos, pp. 207-220. Burrough-Boenisch J (2013c) Righting English that’s Gone Dutch, 3rd ed. Voorburg: Kemper Conseil. Burrough-Boenisch J, Matarese V (2013) The authors’ editor: working with authors to make drafts fit for purpose. In: Matarese V, editor. Supporting Research Writing: Roles and Challenges in Multilingual Settings. Oxford: Chandos, pp. 173-189. Butcher J, Drake C & Leach M (2006) Butcher’s Copy-editing: The Cambridge Handbook for Editors, Copy-editors and Proofreaders, 4th ed. Cambridge: Cambridge University Press. Christiansen S, Flanagin A et al. (2007) AMA Manual of Style, 10th ed. New York City: Oxford University Press. Corpus of American English (COCA). Brigham Young University. /http://corpus.byu.edu/coca/ [accessed 3 May 2013]. Council of Science Editors (2006). Scientific Style and Format: The CSE Manual for Authors, Editors, and Publishers, 7th ed. Wheat Ridge CO: Council of Science Editors. Crystal D (2006). English Worldwide. In Hogg R & Denison D, editors. A History of the English Language. Cambridge: Cambridge University Press, pp. 420-429.
de Jager M (2013) Journal copy-editing in a non-anglophone environment. In: Matarese V, editor. Supporting Research Writing: Roles and Challenges in Multilingual Settings. Oxford: Chandos, pp. 157-171. Einsohn J (2011) The Copyeditor’s Handbook: A Guide for Book Publishing and Corporate Communications, 3rd ed. Berkley CA: University of California Press. European Commission Directorate-General for Translation (2011) English Style Guide: A Handbook for Authors and Translators in the European Commission, 7th ed. : http://ec.europa.eu/translation/english/guidelines/documents/styleguide_english_dgt_en.pdf [accessed 3 May 2013]. Garner BA (2009) Garner’s Modern American Usage, 3rd ed. Oxford: Oxford University Press . Gustavii B (2008) How to Write and Illustrate a Scientific Paper, 2nd ed. Cambridge: Cambridge University Press. Harwood N, Austin L & Macaulay R (2009) Proofreading in a UK university: Proofreaders’ beliefs, practices and experiences. Journal of Second Language Writing 18: 166-190. Kerans ME (2006) Grammarians or linguists? On using language corpus data to guide usage. The Write Stuff 15 (1): 89-92. Mackenzie J (1999) The Editor’s Companion, 2nd ed. Cambridge: Cambridge University Press. Mediterranean Editors and Translators (MET) http://www.metmeetings.org/ [accessed 13 May 2013]. Modern Humanities Research Association (2013) MHRA Style Guide: A Handbook for Authors, Editors, and Writers of Theses, 3rd ed. : http://www.mhra.org.uk/Publications/Books/StyleGuide/download.shtml [accessed 3 May 2013]. Mossop B (2007 ) Revising and Editing for Translators (Translation Practices Explained), 2nd ed. Manchester: St Jerome Publishing. Nadziejka DE (1999) Council of Science Editors Guidelines No. 4. Reston, VA: Council of Science Editors. Norris CB. 1998. Author’s editing – some tips from Finland. European Science Editing 24(3): 66-67. Norton S (2009) Developmental Editing: A Handbook for Freelancers, Authors, and Publishers. Chicago: University of Chicago Press. Peterson P (2004) The Cambridge Guide to English Usage. Cambridge: Cambridge University Press. Ritter RM (adapter) (2005) New Hart’s Rules. Oxford: Oxford University Press. Ritter RM The Oxford Guide to Style (2003). Oxford: Oxford University Press. Sharpe LT & Gunther I (1994) Editing Fact and Fiction: A Concise Guide to Book Editing. Cambridge: Cambridge University Press. Society of English-Native Editors in the Netherlands (SENSE) www.sense-online.nl/ [accessed 15 May 2013]. Springer Exemplar http://www.springerexemplar.com/ [accessed 3 May 2013]. Swales J (2004) Research Genres: Explorations and Applications. Cambridge: Cambridge University Press. University of Chicago Press (2010) The Chicago Manual of Style, 16th ed. Chicago: University of Chicago Press. Wagner E, Bech S & Martinez JM (2001). Translating for the European Union Institutions. Manchester: St Jerome Publishing. Willey I (2009) Speak up/The perils of “convenience editing”. The Daily Yomiuri 13 January 2009 http://www.accessmylibrary.com/article-1G1-191949073/speak-up-perils-convenience.html [accessed 8 May 2013]. Willey I & Tanimoto K (2012) “Convenience editing in action: comparing English teachers’ and medical professionals’ revisions of a medical abstract. English for Specific purposes 31: 249-260. Willey I & Tanimoto K (2013) “Convenience editors” as legitimate participants in the practice of scientific editing: an interview study. Journal of English for Academic Purposes 12: 23-32. The executive body of the European Union, which proposes legislation, implements decisions, upholds EU treaties and is responsible for the day-to-day running of the EU. Also known as false cognates, these are words in one language that look similar to words in another language, but which have a different meaning. An example is the word “preservative”. Its false friends in other languages include préservatif (French), Präservativ (German), prezervativ (Romanian, Czech, Croatian), preservativo (Italian, Spanish, Portuguese), prezerwatywa (Polish), презерватив “prezervativ” (Russian, Serbian, Bulgarian), prezervatif (Turkish), præservativ (Danish), and prezervatyvas (Lithuanian). Its meaning in those languages is “condom”. A term current in the UK to describe the correction/editing of student writing; not to be confused with the reading of galley proofs or electronic texts to detect and correct minor errors before the text is published. Burrough-Boenisch 2013c draws on many such comparisons between English and Dutch style manuals: it is surprising that similar comparisons have not been done for other language pairs.